Wet Bench – Soaks wafers in a tank of chemicals. The tank holds multiple wafers at once, increasing throughput. Single Wafer Chamber – Sprays chemicals onto the wafer as it spins, providing greater individual-wafer control. Using either one of those processes alone can cause problems: Soaking wafers in a wet bench can cause harm to delicate circuit structures and also result in uneven cleaning, while single-wafer stripping alone can have difficulties with removing thicker photoresists completely. 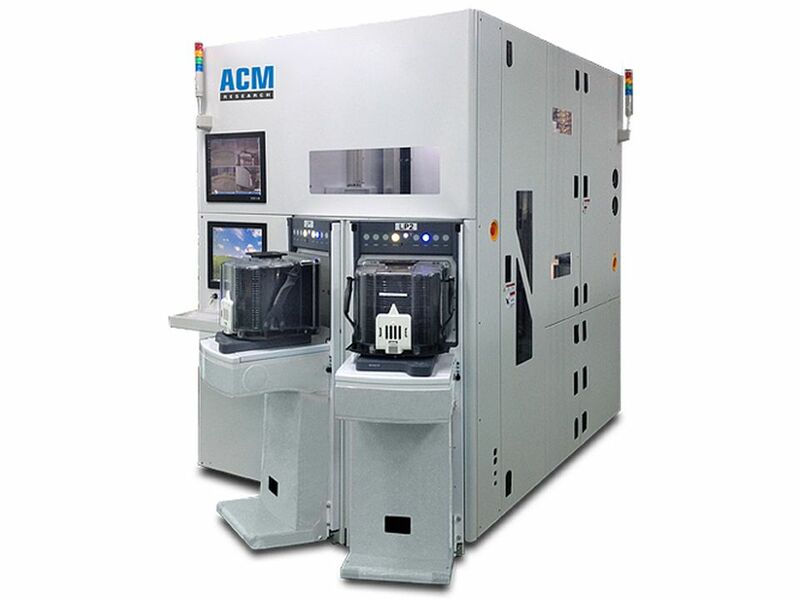 However, ACM offers the best of both processes, providing the high throughput of a batch tool as well as the superior removal performance of a single-chamber tool. This flexible process control, gives manufacturers more and better options for removing thin or thick photoresist as required by the process at hand. In addition, the ACM Stripper can also be equipped with a high pressure option, which can aid in removing very thick or difficult PR coatings. ACM’s wet stripping systems contain powerful modules such as high precision wafer transfer systems, a superior fan filter & exhaust unit, and independent control of the process environment for each chamber. 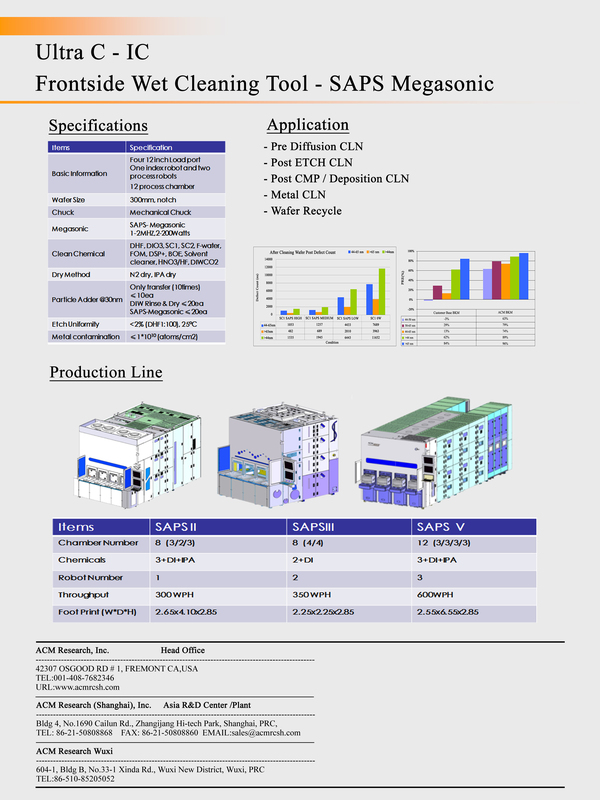 All of these modules are simple to use while providing high quality processes and a very uniform clean. Combined with customizable software, the tool easily integrates into production lines. These tools contain state-of-the-art chemical temperature and flow rate control systems. This ensures that chemicals are released at the precisely correct amount and at the desired temperature throughout the process. ACM’s wet bench technology allows multiple wafers to soak in chemicals which increases throughput as well as softening thicker PR coatings. The wafer can then go into the single-wafer chamber for a more thorough strip. ACM is committed to helping protect our world’s environment. Hence, all our machines are fitted with a chemical recycle and filter systems that reuse chemicals and decrease waste — and also decrease the user’s costs! ACM’s fan filter and exhaust unit removes evaporated chemicals and replaces them with contaminate-free filtered air. The chemicals used can easily evaporate and become a safety hazard for employees as well as causing potential issues for the system if not managed properly. So, the tool’s single-wafer chamber is completely sealed for better particle and chemical vapor control. 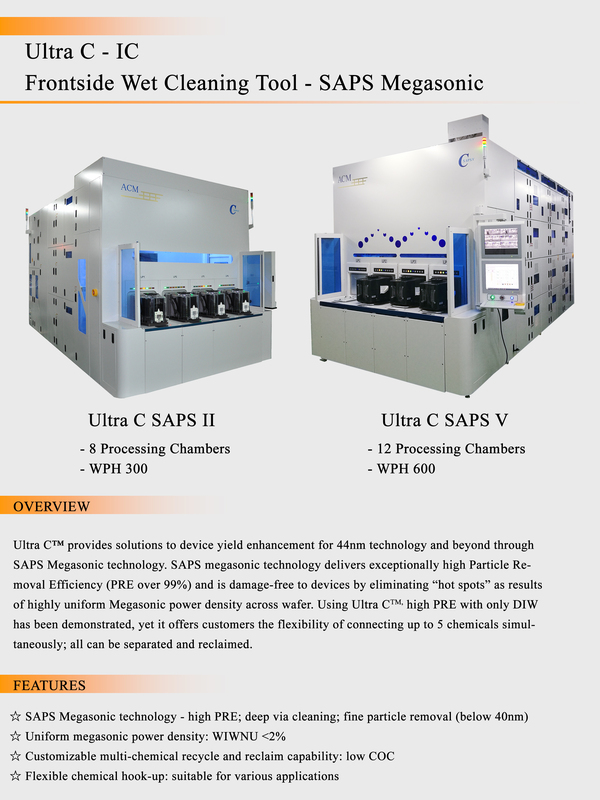 ACM’s wet stripping systems can also be equipped with ACM’s proprietary SAPS megasonic wafer cleaning technology to remove particles as well as photoresist — even for very small particle sizes — without damaging patterned wafer structures.